Brown Long-eared Bats are second only to pipistrelles in their abundance in the British Isles. A long-eared bat has ears almost as long as its body. You might not notice this feature when the bat is at rest, because at that time its ears are usually curled back or even tucked out of sight beneath its wings, leaving only the inner lobe, called the tragus, showing. 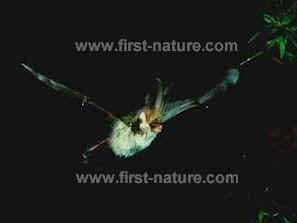 The Brown Long-eared Bat is 4 to 5cm head-and-body length and weighs 6 to 12gm. It is in most respects very similar in appearance to its close relative the rather larger Grey Long-eared Bat (Plecotus austriacus), a rare species sometimes seen in southern England. It is very difficult to differentiate between the two long-eared bat species. 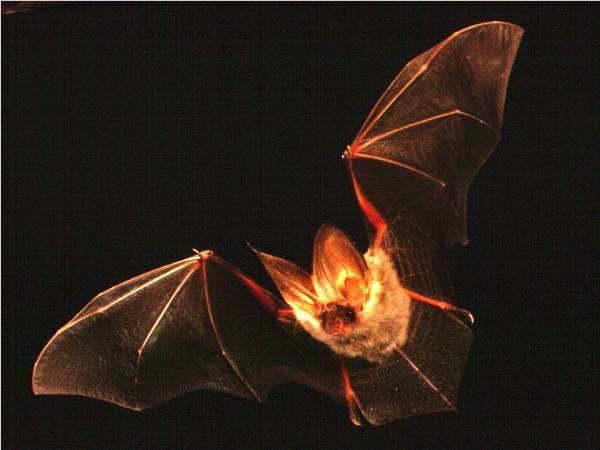 Capable of eating quite large insects, including moths and beetles, Brown Llong-eared Bats capture and consume much of their food in flight; however, they also take prey back to favoured perches, which are easily identified by the piles of discarded insect wings that build up beneath them. They also fly close to the ground, occasionally alighting to seize an insect, and that makes them vulnerable to nocturnal mammals, and in particular prowling cats. Rarely do these bats emerge until after dark. Then their favoured haunts are trees at the edges of woodland or parks. Sea trout fishers on the famous sewin rivers of Wales may catch fleeting glimpses of Brown Long-eared Bats on moonlit nights. Brown Long-eared Bats mate in the winter months and usually have just one offspring at the end of June or early July. They live in colonies of typically 25 but occasionally 50 or more bats, and their lifespan can be as long as 30 years. Summer roosting places include hollow trees and the roof spaces of large buildings, where they cling to beams near the apex. In winter these bats are known to roost in caves and mine shafts, and it is likely that they also roost in hollow trees and in the roof spaces of large houses. This page includes pictures kindly contributed by Melvin Grey.